There was once a mage named Grimier who wanted to know all of the forms of magick and was silenced by the mages guild. Silenced meaning being bound at the world’s end where he could do no harm. He was too ambitious for his own good. Things were peaceful for a while but monsters have started to appear and they are getting stronger and deadlier. You’re the perfect mage for the job to see what’s going on. Magicka starts off at the mages academy where your friends are throwing a "save the world" party for you. After a spell misfires you wind up falling down into the basement where you will go through a training course on how to use the interface and elements to conjure up some spells. There are eight elements and you can combine up to five items at a time. The elements at your disposal are fire, water, ice, earth, arcane, life, lightning, and shield. Some of the elements cancel each other out while others are hazardous to your health if used at the wrong time. For example, don’t use a lightning spell if you’re dripping wet. First, dry yourself off with a fire spell. You can target spells on yourself, ahead of you, or the area of effect around you. Strong Points: Fun concept; hilarious dialogue and game/movie references. Weak Points: When released this game was riddled with bugs and unplayable for many for weeks. Moral Warnings: Magic use, violence (blood can be disabled), mild language. Spells can be learned by finding and reading spell books scattered throughout the world. Most of the spells are learned by trial and error. When you add arcane to the mix it makes a very powerful beam of water, fire, or electricity. Unlike Ghostbusters, crossing beams in this game can be a good thing! When you add earth to lightning or ice you can make some powerful projectiles. Earth can also make land mines that can heal or hurt depending on the elements that you use. My other gripe with this game is the stability. This game was unplayable for many for the first couple of weeks it was available. To their credit, the developers were releasing patches every other day. At version 1.3.4.1 it’s now pretty stable. I never ran into problems playing the game. I did experience crashes to my desktop after reaching a boss. This is where save states would have come in handy. The other glitch that I experienced (and is now fixed) was the ability to join a steam game from the chat client. I was able to join a game but my graphics would be all blacked out and hard to navigate. How this wasn’t tested before release is beyond me. So yes, there is multiplayer support. You can have up to four players in a game. The players have to be in the game before it starts, you cannot join mid-game. You can play locally, on a LAN, or through the internet. The game difficulty does not get any harder when other people join; the only challenge added is not killing your friends! There are two online game modes, Adventure and Challenge. In challenge mode you have to fight off waves of enemies and whomever stays alive the longest lives. The adventure mode is playing the main storyline with help. Any progress made or spells learned are carried back over to the host alone. If you play on someone else’s game your save file won’t be impacted at all. It’s also worth noting that the save games are stored locally so if you play on multiple computers you will have to manually transfer over your saves between systems. I love the humor in this game. Magicka pays homage to many games and movies that I recognized. There are references to Kings Quest, Zelda, Metal Gear Solid, Star Wars, Back to the Future, Highlander and more. If you like RPG’s, this game will poke fun at that genre too. The sound effects are great and the music is pleasant to listen to. The enemies each have their own sayings for example the druids chant “Ni!” when they cast their spells and the goblins yell ”Scotty!” whenever they warp. Unfortunately some of the humor is a little off color and some of the achievements have some language in them. If you don’t like magic or violence, this is not a game for you. By default, there are pools of blood and gibs flying around when you kill a monster. While the blood can be disabled, the magic is unavoidable. 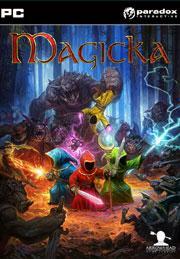 For $9.99, Magicka is definitely a fun game and worth buying if you like satire or fantasy based games. With a big enough party, you can easily blitz through the game relatively quickly. With the challenge mode and the ability to play the game at a harder level after beating it, there’s plenty of game time here. Many of the show stopping bugs have been squashed so I’d recommend this game now. That would have been a different scenario a couple of weeks ago, though.